The “Home” sign. No matter where you are, if you click that you will be returned to the screen as currently shown. A message like this sometimes appears between the “Home” and the “Play” buttons. It indicates that there is a problem with the game. It can be that there is a bug and a champion is disabled like in this case, but it might also tell you servers will go offline, there’s a problem with an item and therefore it’s disabled, etc. It’s just a warning for you, and since usually that area is empty you should notice it. The Play button. If you click here, you will enter a screen which allows you to select certain game modes. I will elaborate on this later, for now there are more important things. 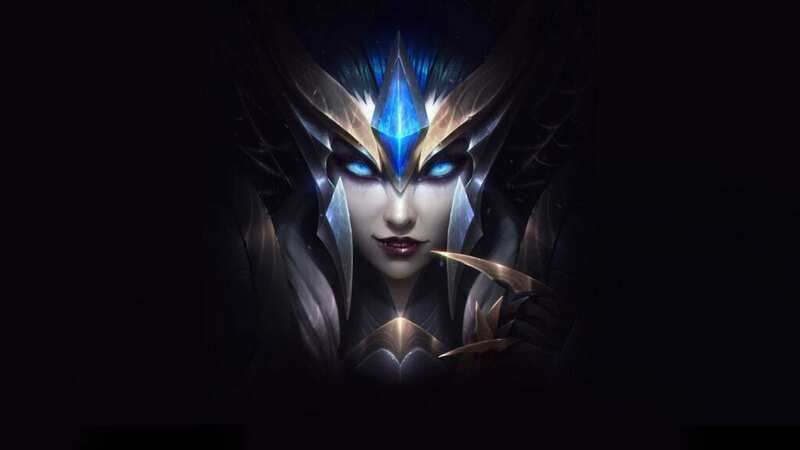 Your Summoner Icon. You can change it by clicking it, a little menu will appear and you can select your favorite. It does not affect anything in any way, so just choose the one that looks the coolest or prettiest. 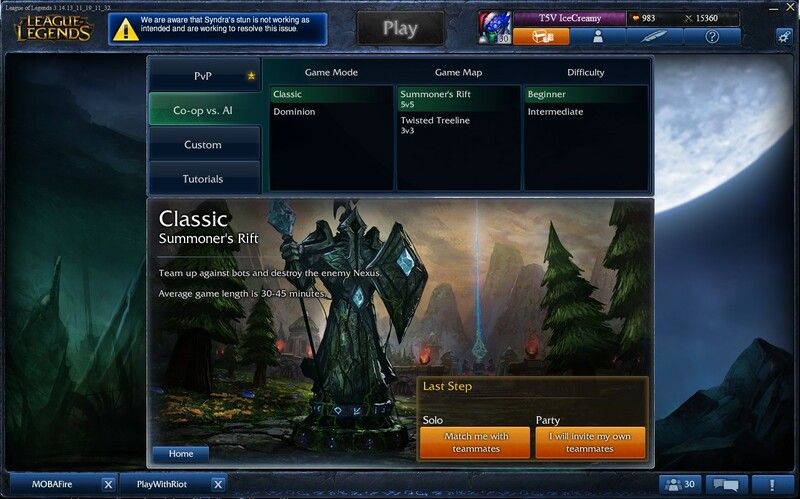 The number in the bottom right corner of that icon is your Summoner Level, of which the highest value is 30. Your Summoner Name is on the left. If people ever want to add you as friend, they will have to use that name. Other people can see it, so be advised that you take a proper summoner name (no racism, insulting and other idiotic stuff!). Also there is the current number of RP (middle) and IP (right) you have. RP (Riot Points) can be obtained by spending actual money, whereas you get IP (Influence Points) from just playing the game. The Store. If you click it, you will be shown a screen with a lot of buttons on the left side. You can purchase all sorts of things, but you should find that out for yourself. Your own Profile. Here you can see how many wins you have per game mode, your last 10 matches including your statistics, which champions there are, what Runes you currently have, what Masteries you currently have set, and what Summoner Spells are available for you. If you click the box that says “Find Summoner”, you can also take a look at other people’s Profiles; however you can not see their Ranked Stats and which champions they own. The chatrooms you are currently connected to. 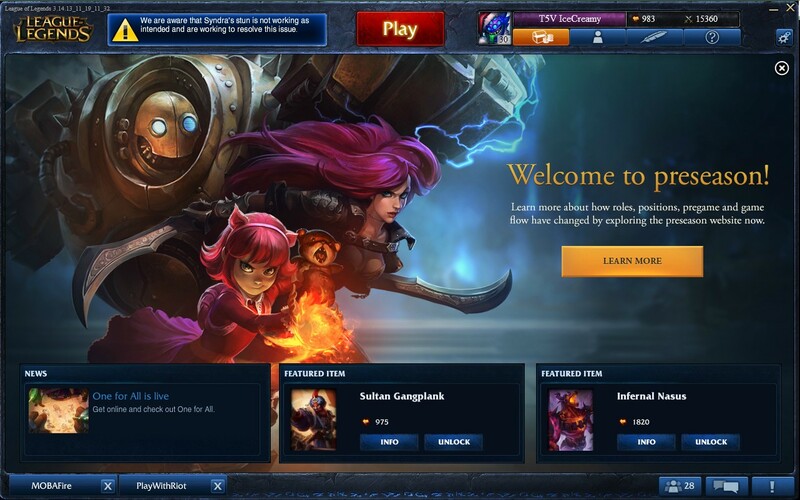 If you log in for the first time it is probably empty, but as you can see I am connected to the PlayWithRiot chatroom and the Mobafire chatroom. Usually people who are active in this community go there and have fun with each other. Also any private chats appear in the area, if you are talking with a friend for example. The button on the left is your Friend List. It is empty if you connect for the first time, but the more you play the more friends you will (hopefully) make. If you click it, a tab will open. You can see your Friend List, the people you recently played with and the people you ignored. All the way at the bottom, you can add a friend folder (for example, make one for people you know via Mobafire, or people who speak the same language as you), search for other players (which will bring you to the screen as discussed in #6, but then of that player) and add a friend. The middle button shows the Chat Rooms. If you want to, you can click the button all the way at the bottom and join a chatroom with a certain name (hint: try Mobafire). The button on the right shows your Notifications; Friend invites, game invites, and all sorts of messages from the game itself will appear there. Note that you can click most of those to get some additional information, such as accept/decline a friend request or accept/decline a game invite. brings you to the Options. If you are not satisfied with the current settings, you can alter them. So far the basic explanation of PVP net, on to some more in-depth stuff! Well, now the fun part starts. You are almost set to play your first game (note: You might have already played 1 or 2 tutorial matches. If you have not done that yet, please do so, they are not great but they give a basic explanation of the game and its mechanics)! But before that, you can already spend something. Head over to your mastery page (if you can not find it just yet, click the button that brings you to your Profile and click the Masteries tab). You will notice that you have 1 point available (since I am already level 30, I have 30 available whenever I create a new Mastery Page)! You will gain 1 point every time your Summoner Level increases (maximum is 30 points). You have a completely free choice when it comes to where you want to place it. I will explain more about masteries later on, so just trust me here and place a point in the Sorcery mastery in the Offense tree. You can either left-click on the mastery you want (not here, in-game) or you can hover your mouse over the icon and scroll up. On the left you can also give a name to that mastery page, but for now Mastery Page 1 is just fine. Now that you have done that, it is actually time to start playing! Hit the big red Play button, and you will be shown some options. So now it is time. Time to actually start playing the game. Once you have successfully completed both tutorials, you should play some Co-op vs. AI matches. If you click that tab, you must choose your Game Mode. A brief explanation is given, but I recommend learning how to play Classic first. 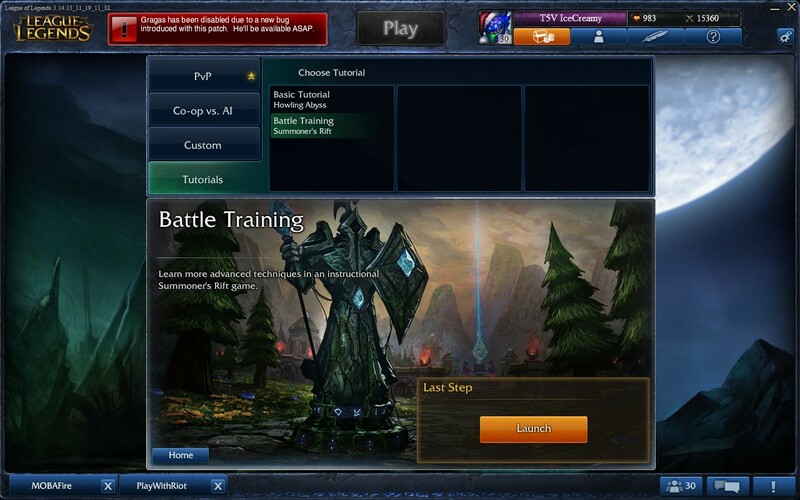 Click on Summoner’s Rift to the right, and set the Difficulty at Beginner. This means that the bots are not playing that well, but since this is the first time you are going to play they might be a challenge. Hit the “I will invite my own Teammates” button at the bottom if you want to invite your friends, click the “Match me with Teammates” button otherwise. Once you have done that, you should notice you are back in the very first screen. Only one thing has changed: Instead of that big red Play button, there should be a timer. It shows for how long you have been waiting. It should not take that long; eventually you should get a pop-up. Click the Play Now button, and you will be taken to a screen which looks really chaotic. #1 is your team, containing you and 4 others. #2 is the opponent team, consisting of 5 bots. In other game modes they might be people. Note that I started a game myself here, without any teammates or opponents. Usually that list will be filled. You can see the names of your teammates, but not those of your opponents. #3 shows the team chat room. #4 is where you can choose your Champion. Every champion has its own unique skillset, providing a different approach to the game each. Choosing your Champion is probably a difficult decision at first, but just pick one you think might be fun. There are always 10 champions available for you. Those Champions are in the so called Free Week Rotation, meaning that every single person can play that Champion. Note that if someone already picked a champion in your team, you can not pick it yourself. If you do not manage to pick a champions within 90 seconds, one of the available ones will randomly be assigned to you. I will provide you with more information about Champions later on. #5 is where the runes and masteries are situated. 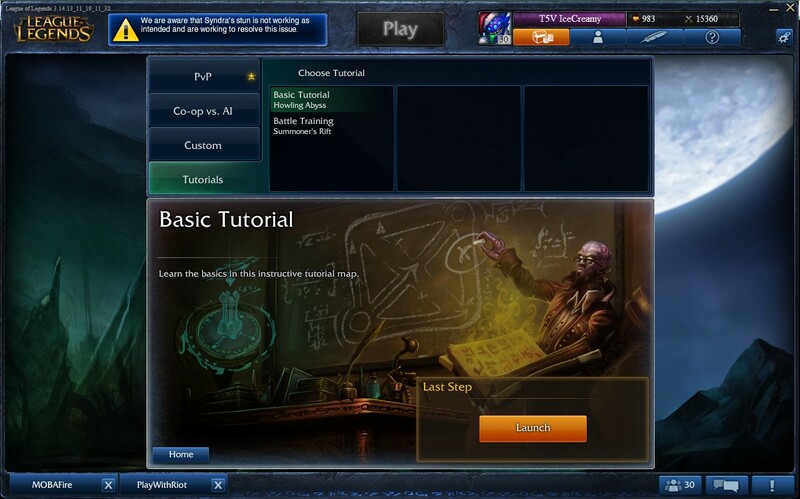 Leave Rune Page 1 and Mastery Page 1 as they are. #6 is a place of interest. 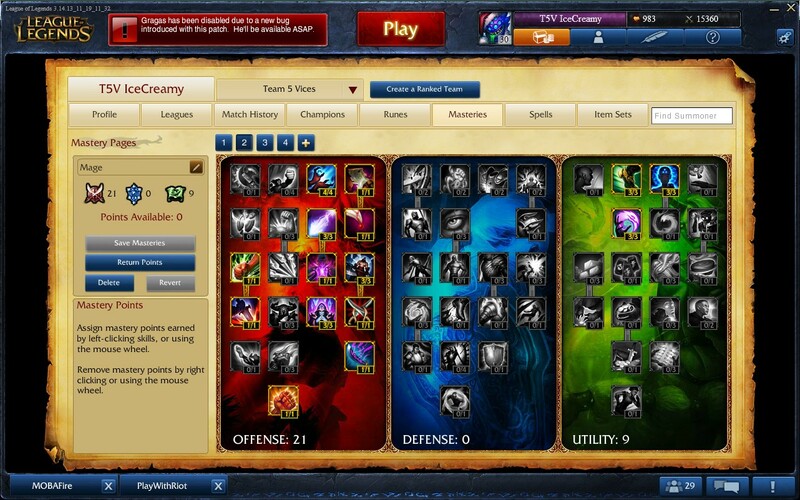 Those 2 icons represent Summoner Spells, which you can use when playing. You can only pick 2, so choose wisely! If you click either one of them, a pop-up will appear. You can see 13 options, of which 7 are currently available (assuming you are level 1). I recommend taking Heal and Ghost for now. More information about this will follow. #7 shows the Lock In button. Once you are completely done with everything, click it. This will make the Champion list disappear, and a list of Skins for the Champion you picked will appear. You probably don’t have a choice right now, since you can not choose the Skins that are Locked. Now all you have to do is wait until every player in the game is ready, and then the game can begin! Note that it is not necessary to click it, after 90 seconds you will automatically be locked in. #1 gives you some info about yourself. The time the game is lasting, the number of Champions you killed, the number of times you died and the number of times you helped someone else get a kill are on top. Slightly below that is your FPS (Frames Per Second) and your ping. Even lower is the amount of kills your team made in total, and the amount of times your team died in total. #2 contains more info about your Champion. 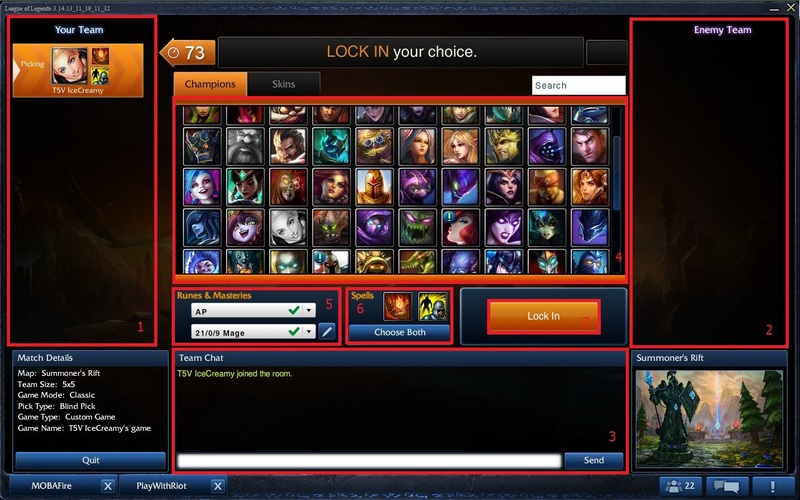 The icon shows with Champion you are playing (in this case, Lux). On the bottom right is your Champion Level (maximum 18). Below that is your xp bar, so you can see how long it will take until you gain a level. To the right of your Champion icon, are some stats. From top to bottom: Attack Damage, Ability Power, Attack Speed, Movement Speed, Armor and Magic Resist. I will elaborate on those later. Every number that is green, has been increased in some way. In my case that comes from Runes and Masteries. To the right of that are the items you currently have in your inventory. At that time I had not bought any items, but obviously I bought some later; items are the most important thing when you are in game. As you probably expected, I will go into those later. At #3 you see your skills. The 2 bars at the bottom show your current health/maximum health, and the bottom bar shows your mana. Not all Champions use mana; some use Fury, Energy, nothing or something special. The 8 icons each have a different meaning; the one on the left is the Champion’s passive or innate ability. If you hover your mouse over it, a small pop-up will appear containing information about that ability. 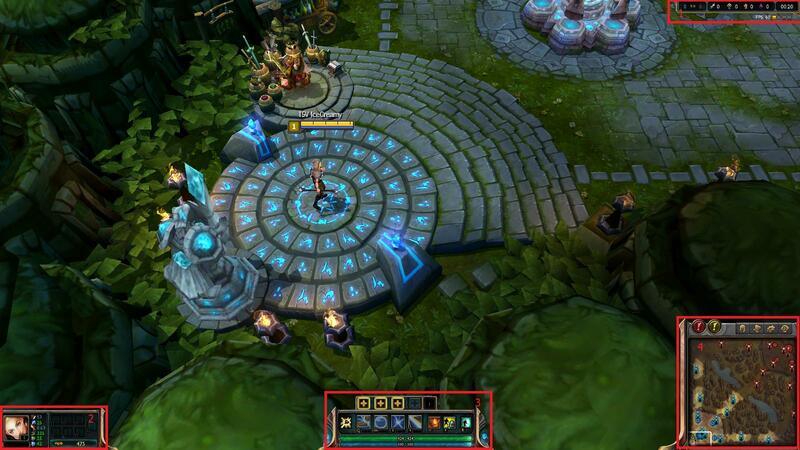 The 4 icons to the right of that are usable abilities, which are usually bound to the Q, W, E and R keys. The R skill is often referred to as ultimate. Again, if you hover your mouse over it, you will be able to read some additional info. Since I haven’t chosen any spell yet, I can take any of the abilities with a + above them (unless it’s grayed out). More information will come later. If you move on even more to the right, you will hopefully recognize those icons. They are the Summoner Spells you chose! The left one is bound to the D button, the left one to F. The icon all the way on the right is the Recall button. You can click it, or hit the B button on your keyboard, to return to your spawn. Note that this only works if you are not being attacked during the channeling time. #4 contains some system icons. Here you can set various settings, you could play around with them yourself. There are more options that you can change. Hit the ESC button, and you will find another menu. Try to fiddle around with the settings until you like them. The two buttons on the left, a red one and a yellow one, are smart pings. The red button can be used to ping a target (such as a turret or an enemy Champion) which indicates you need help somewhere (use the G button as shortcut for it). The yellow button can be used to tell your allies to Fall Back from a certain area (the V button is the shortcut for it). If you click either, you can drag your mouse in 4 directions to ask for assistance, tell there’s danger, say you’re on your way or that an enemy is missing. The green part on the bottom left is your base. It contains a spawn (the place you come to life when you start the game or when you died and are revived), a Nexus (where minions spawn from, and which the enemy must destroy to win), 2 Nexus turrets (defending the Nexus), 3 inhibitors (when destroyed, the enemy team will have a bonus, which I will explain later on) and 3 inhibitor turrets (which defend the inhibitors). The red part on the top right is the enemy base. If you are playing normal games, it is possible that the red part is your base and the green part is the enemy base. The part above and left of the orange line, is top lane. 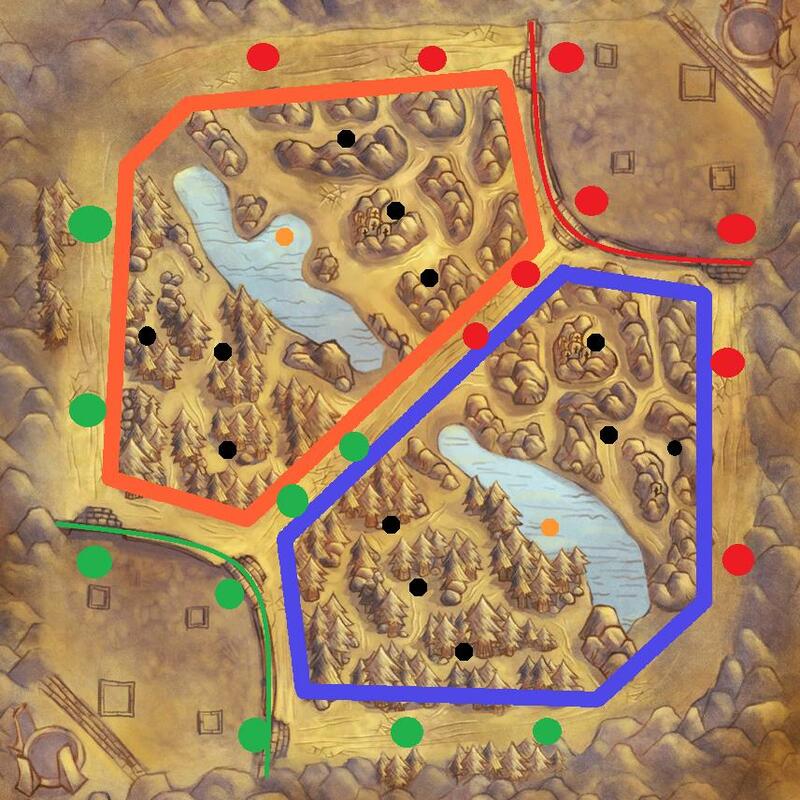 The part between the orange and blue line is mid lane, and the part below and right of the blue line is bot lane. Each lane contains 3 turrets (seen from the base: inhibitor, inner and outer, represented by green and red circles) and an inhibitor. The space surrounded by the orange and blue lines is referred to as Jungle, where you can kill some neutral monsters (the black and orange dots). They grant gold, and some grant mana and/or buffs. More info will come later. Some more general info: You can use the enter button to chat. If you write /all in front of your message, all 10 players in the game will receive the message. If you write /r (name of friend) and then your message, you will send a Private Message (PM, or whisper) to that friend. If that friend has sent you the last PM you received, his/her name will automatically be filled in (so you don’t have to type it). You can also try clicking some other buttons outside of the chat function, just to test their effects. This guide is powered by Mobafire.